Frame your memory so I could see it tomorrow. Your place in mine has gone off with the tide. Memory is not quite the warmth that was once on me. So gather the particles and weigh in; it’s not too dispersed. I will look up and fly the gossamer of you yesterday. Could you withstand the mind without the frame? See it against the sea. 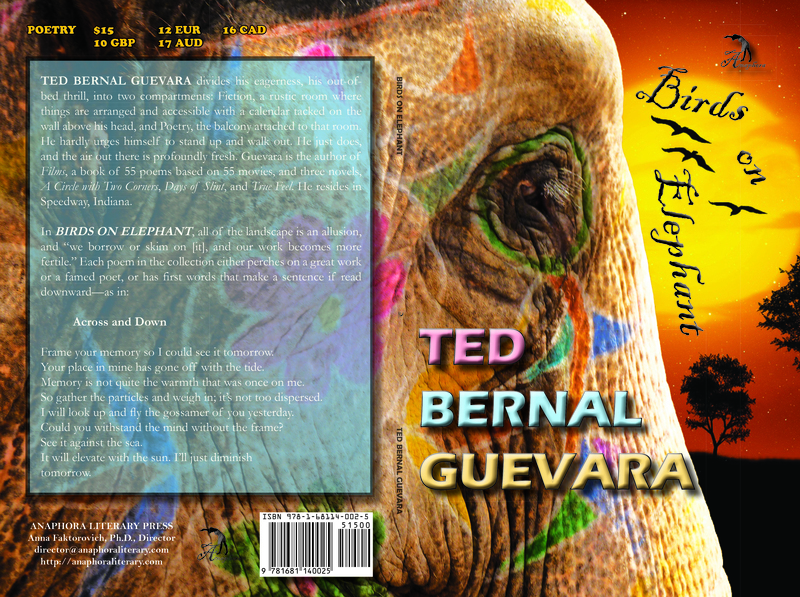 Ted Bernal Guevara divides his eagerness, his out-of-bed thrill, into two compartments: Fiction, a rustic room where things are arranged and accessible with a calendar tacked on the wall above his head, and Poetry, the balcony attached to that room. He hardly urges himself to stand up and walk out. He just does, and the air out there is profoundly fresh. Guevara is the author of Films, a book of 55 poems based on 55 movies, and three novels, A Circle with Two Corners, Days of Slint, and True Feel. He resides in Speedway, Indiana. Review: “May 2015 Exemplars: Poetry Reviews by Grace Cavalieri” included a review of Birds on Elephant in the Washington Independent Review of Books, May 19, 2015.